Let’s Give a Hand to Sohana Research Fund for a World without EB! You all know by now Damian Lewis is a proud patron of Sohana Research Fund. Sohana Collins is a young teenager who was born with recessive dystrophic epidermolysis bullosa (RDEB or EB) which means she lacks the protein that holds her skin together. Kids with EB have extremely fragile skin that they are sometimes called “butterfly children.” Lots of activities we take for granted as easy routines in our daily lives are a struggle for them. Can you imagine a day where your dressing up takes up to two hours and eating and drinking cause blisters in your mouth and throat? These kids have to deal with this kind of pain every single day. I am old enough to know that life is not fair, but I still cannot come to terms with the fact that such awful conditions happen to children. EB is a serious condition. There is good research being done, and it is the only thing that can do the magic to have a world without EB. That’s why we need more research and need it NOW. The clock is ticking and we should ACT immediately to raise more awareness and funds to help find a cure for EB. So one week is not enough to raise awareness about EB. We need to make every week EB Awareness week. All Sohana wants, like all other EB kids out there, is a cure for EB. Here’s her message about why EB stinks! EB stinks. That is a fact. And there are many ways to HELP in having a world without EB! Fund-Raise for Sohana Research Fund! In 2015, an incredible 19 year old, Tom Davies, became the youngest person to cycle the world and raised more than 50,000 pounds for several charities, one of which was Sohana Research Fund. It doesn’t only take courage, strength, and determination but also a BIG GOOD HEART to do this and Tom Davies gives me HOPE for humanity. Hats off! Having said that, only a handful of people can do what Tom did! So there should be other things, we, the middle-aged crowd, with day jobs and families, can do to HELP and inspire others to do the same… That’s exactly why I decided to run Bull City Race Fest Half-Marathon and fund-raise for the fund last year. A half-marathon also takes training time and some strength in the legs but ultimately it is doable and totally worth it. 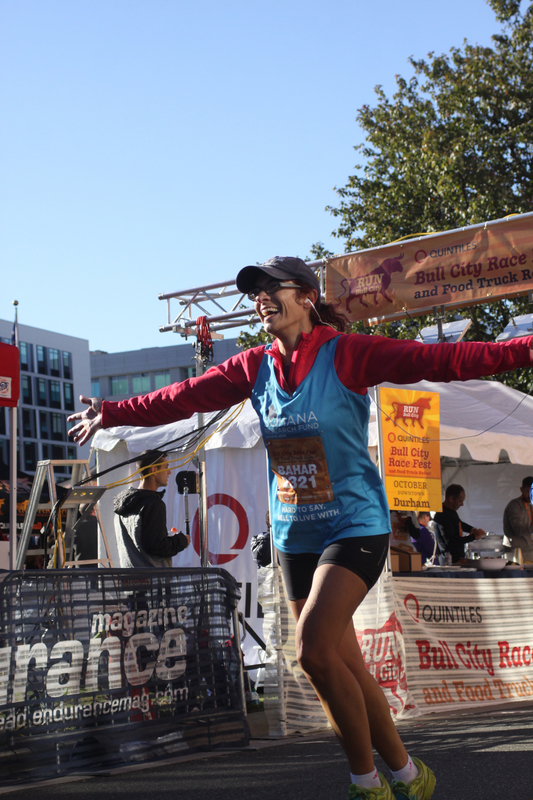 See how HAPPY I look as I cross the finish line. Well… If I could do it, you could do it, too! And, it doesn’t need to be a half-marathon. There is always a 5K run or a walk or you can just play to your own strengths and get creative with it! What about a cook-off, a bake sale, or a board game tournament and then donate the proceeds to the cause? I know they will. And I hope we can help all butterfly kids feel better so they have a chance in changing the world as well! Now… If you don’t have the time or energy to fund-raise then you can still HELP! Donate to Sohana Research Fund! You can always securely donate at the fund’s Just Giving Page. Since the family covers the cost of events, fund-raising as well as the administration services, 100% of donations individuals make to the fund directly go into the research projects. There is no small gift and every dollar counts!